The immersive Floresta Encantada – or enchanted forest – exhibit uses a virtual reality app. WATERVILLE — For the next several days, a parallel universe can be accessed in downtown Waterville. Once inside this other world, lucky voyagers can trek through a junglelike terrain, which can lead them to the depths of a dim cave full of crystals, through the mist of a gorgeous gurgling waterfall and to the farthest edge of the dimension beneath a brilliant blood-orange sky. Along the way, visitors might engage a friendly cheetah that will let them pet its head. They might pick up the maracas next to a Brazilian man and shake them while he beats on his bongo. They might meet the Amazonian white monkey that can cleanse their soul with the smoke of sage, and if they listen to the native tribesman with an open heart, he might offer them a special potion that will take them on a trip to a secret place beyond the forest walls. And if people want to access this world, all they need to do is put on a special pair of high-tech goggles and believe in what they see. That’s what the creators of this digital dimension ask of the visitors at their MIFFONEDGE exhibit: try to connect with the energy of Floresta Encantada – or, the enchanted forest. The exhibit is part of the Maine International Film Festival taking place this week in Waterville. Soloaga, 35, and her partner, Ygor Marotta, 31, designed the world of Floresta Encantada using a virtual reality app that allowed them to draw within their characters within the world. Traditionally, the artists based in Sao Paulo, Brazil, have used animation as their medium of choice. Two years ago, VJ Suave brought an installation inspired by the folk tales of Brazil to the Maine International Film Festival in which they projected animations onto buildings from a tricycle in the street so that it was a moving piece. They went on the road with the exhibit, traveling to 15 different countries to share their art. 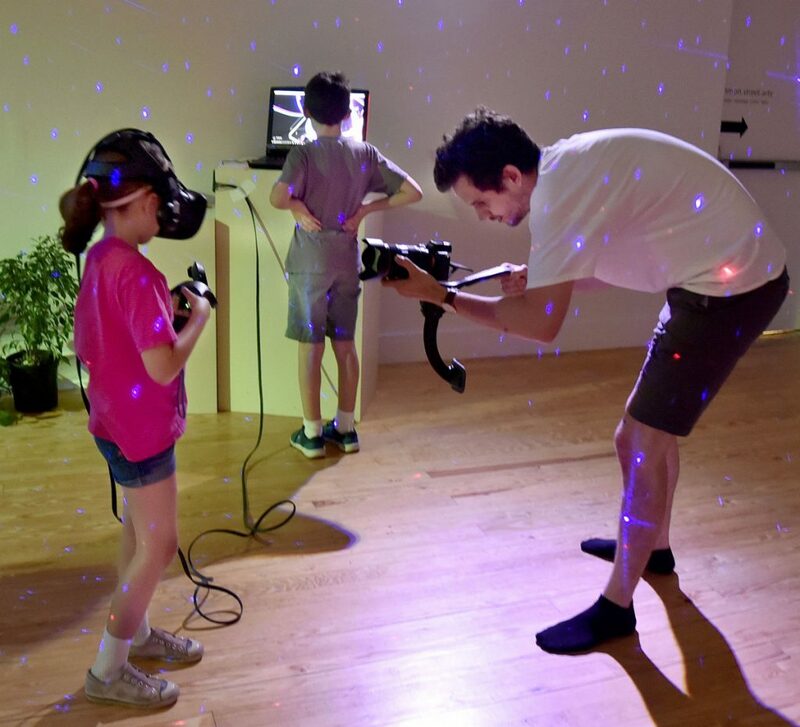 Ygor Marotta, center, helps a child with a Google app called Tilt Brush at Common Street Arts in Waterville. He and Ceci Solanga make up the duo VJ Suave, based in Sao Paulo, Brazil. “We want artists and the kids to have the access to this new kind of art,” he said. “Now we are here again with the virtual reality,” Marotta said Monday afternoon from their exhibit at Common Street Arts. He added that years ago, people who designed characters and worlds for virtual reality had to be very skilled in a complex software. Every day during the film festival, people can visit the exhibit and enter Floresta Encantada for 10 minutes at a time at no cost. VJ Suave are also conducting workshops to teach others how to use the technology to create their own artwork. On Monday afternoon, the pair helped children use a Google app called Tilt Brush to paint their own masterpieces using smoke, stars, fire and what looks like different colored laser beams. Penelope said her dad has a virtual reality machine at home, but it doesn’t let her draw pretty pictures. Marotta said they’ve been traveling with this installation for the past year and have held similar workshops for children and adults. “We want artists and the kids to have the access to this new kind of art,” he said. He said it was hard to define what the exhibit is, as the mix of the art and technology is quite new. Soloaga said it’s odd that they had created nature inside of technology, but hoped it was a way for people to connect with nature and think about how humans treat the planet. “We want to talk about taking care of nature, educating with it and respecting it,” she said. Marotta also said he hopes visitors are enchanted by the nature.